Montenegro Railway Infrastructure Company (ZICG) will launch in the second quarter of 2019 a tender for the procurement of the remaining goods, works and services. The EUR 17 million contract envisages the rehabilitation works for the slopes. The contract will be financed with the proceeds of a loan from the EBRD. 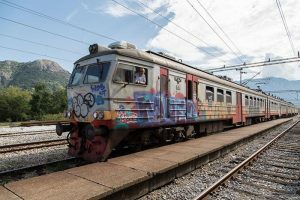 As Montenegro intends to integrate its railway infrastructure with the European railway network, the country has launched several projects to modernize and develop its transport infrastructure. The National investment company adopted at the end of 2015 a list of priority infrastructure projects for 2020, which included two railway projects: Route 2, envisaging the reconstruction and electrification Podgorica-Tuzi-border with Albania and Route 4, involving the modernisation of signalling and safety systems, refurbishment of superstructure and substructure on Bar-Vrbnica line. corridors Vc and VIII across the territory of Montenegro. With implementation of these objectives the railway network of Montenegro would be fully integrated in corridors of TEN-T network. At the end of 2018, Montenegro and Albania officially opened the joint railway station Tuzi, located on the border between the two countries. Under the negotiation with the EU on Transport policy (Chapter 14), this common railway station is a milestone and the first railway station of this type in the region. To modernize the railway between Podgorica, Tuzi and border with Albania, Montenegro has prepared an application for the preparation of the main reconstruction, electrification and modernisation project for the24.7 km line, that had a total value of EUR 2 million. For the (Beograd)-Vrbnica-Bar line, EUR 64.5 million was provided for modernization works, for all phases of reconstruction and funds in the amount of EUR 183,2 million are still missing. EUR 26,2 million euro was provided from IPA funds (2016 – 2020), EUR 2.5 million from WBIF and EUR 40 million from EIB and EU. In December, the Directorate of Public Works of Montenegro has signed supervision and works contracts for track rehabilitation on the Vrbnica–Bar railway line, including repair works on overhead power lines and telecommunications utilities. The part of the line which will be repaired is approximately 6.74 km long and is located between the stations Kos and Trebesica. The works will be performed on the track while traffic is operating on the line in order to minimise disruption to passengers and freight traffic. Motenegro has another two railway projects. The modernisation of Pljevlja-Bijelo Polje (Ravna Rijeka)-Berane-border with Kosovo. This project has a previously prepared feasibility study and preliminary design of a new railway Pljevlja-Bijelo Polje (Ravna Rijeka)-Berane-border with Kosovo. 7 options of the solution were elaborated and construction of inter modal terminal in Berane was proposed. It was estimated that for the selected option of section Pljevlja-Bijelo Polje (Ravna Rijeka) it would be necessary to have EUR 745 million and two options were selected for the section of Bijelo Polje (Ravna Rijeka)-Berane-border with Kosovo where EUR 523 million will be needed.